Praha hlavni nadrazi is the main train station in Prague. It is the busiest railway station in the Czech Republic. 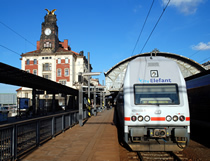 The station is 5 minutes walk from Wenceslas Square and 15 minutes from the Old Town Square. Praha hlavni nadrazi opened in 1871. The Art Nouveau station building and station hall were built between 1901 and 1909, and then extended during the communist period. Recently the railway station has undergone major renovation. Original features such as the lofty dome, stained glass windows and carved faces of women representing Prague as the 'Mother of Cities' have survived, while new areas have been added. Praha hlavni nadrazi is split over many levels and different areas. Facilities include 24 hour luggage storage (over the counter and lockers), bookshops, pharmacies and other medical and toiletries vendors, and restaurants and fast food outlets. There are also currency exchange offices and cashpoints (ATMs), plus a Public Transport Information Centre. The metro station at Praha hlavni nadrazi is Hlavni nadrazi (line C). And there is a tram stop nearby: exit the train station, and with the park in front of you turn right and walk down the slope. The second train station in Prague is Nadrazi Praha-Holesovice. Check train times and book tickets at České dráhy (Czech Railways). The website is available in Czech, English and German (select 'en' or 'de' on the top right-hand corner of the page). Alternatively, buy tickets in advance or on the day of travel from Praha hlavni nadrazi. Tickets are generally available to national and international destinations right up until the time of travel.